The Family Child Care Legal and Insurance Guide takes the intimidation out of running a family child care business by helping you with legal and insurance planning. 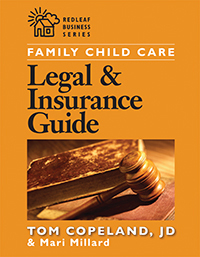 From researching and purchasing insurance to protecting against lawsuits, family child care expert Tom Copeland details the many practical ways you can maximize your knowledge about the safeguards needed to ensure the health and prosperity of your business. Read a sample chapter of this book!